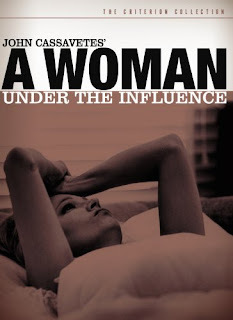 I didn’t know what to say after watching A Woman Under the Influence. I was stunned, silent. There were times when I simply couldn’t look at the screen. Watching its characters was intrusive and so painfully embarrassing that I felt safer with my hand shielding my eyes. The film begins with a housewife, Mabel, sending her three kids away for the night with her mom. She has planned an evening together alone with her husband, but Nick calls and cannot make it. He works for the city and a water mane has burst. Mabel is upset, passionately so, and checks into a bar and brings home a stranger. Nick insists to his co-workers that Mabel is not crazy, and because we’ve only just begun to witness their life together we side with Nick. But it becomes very clear that something is wrong with Mabel, and John Cassavetes’ brilliant film depicts a series of episodes or moments in their life together that are beyond realistic and probably the only honest and horrifying scenes of mental illness ever shot. We all leave the house and leave the secrets inside. The outdoors provides a temporary escape, and it is possible that those who suffer such fates are very enthusiastic in their public selves to overcompensate for the pain at home. This is Nick. The first time the screen became unbearable was during the long breakfast / dinner scene where he brings his coworkers home, possibly to prove to Mabel that he did work and ease the tension of her mind. Mabel has just woken up from her night with the strange man, and after a dazy introduction with Nick’s coworker friends, Mabel and they make a huge spaghetti meal. This is one of the best scenes I think I’ve ever seen in an American movie. I can only compare it to the extended Christmas family meal from Ingmar Bergman’s Fanny and Alexander. This early morning dinner scene continues as if we were a spectator at the table. Cassavetes’ direction is relentless; we get intimate in the harmonious moments, like when the unstable Mabel asks each of the coworkers their name. She and Nick share some very odd personal glances. It is obvious that something is going to go wrong. When he lashes out at her for insisting a little too much to dance with one of them, the dense, terse mood was so recognizable from real life that I had to force myself to turn back to the screen. It’s a moment where film ceases to be a series of flat images on a screen and where it becomes the present reality. Gena Rowlands gives one of the best performances I have ever seen. I won’t be able to express myself the way I want because I am still trying to comprehend it, but I was dumbfounded by her focus and concentration. I won’t describe it further. Such things need to be experienced individually, and if I oversell it the performance can’t possibly live up to my promise. The expectation would be too great. But I could not believe what I was seeing. I will say that Ellen Burstyn winning for Alice Doesn’t Live Here Anymore falls in line with the gross negligence the Motion Picture Academy is historically famous for. Peter Falk is great too, and his performance is quite dangerous. I truly didn’t like his character, but I understood him. Nick and Mabel’s relationship made sense to me, even though I hated that they are a couple. They seem to do so much wrong and yet I don’t think they could make it alone. Nick certainly couldn’t. He’s the kind of mutt that clings to out of loyalty, regardless of the damage he causes. Damage not just to Mabel but to their kids and to himself. He seems equally unstable. His temper is short, his force brash and violent. His insecurities and ignorance can help no one. Mabel has a clear illness, though I’m not sure how much of her illness stems from a chemical imbalance or is caused by the people around her. I will admit I know nothing about true mental illness, but her parents, her father especially in one frightening later scene, her mother-in-law, herself and her family can never work harmoniously. Everyone seems to know the right thing to do and everyone has a unique way of setting things right, but no one listens. Mabel, who cannot focus like the average person, is treated like a patient in need but everybody else gets away with doing her in. Worst is Nick, who may have a reason for his condition. His reason is Mabel’s lack of stability, but he should be man enough to relinquish some control. When he tries to help he sometimes hurts, but there are moments where these two seem to function together: the breakfast scene, or the night when Mabel returns from an extended stay in the hospital. His direct temper, his lack of coddling her, seems to set her right for short bursts, and though the film ends with them tiding up, actually and metaphorically, they are still going to have the same problems. John Cassavetes really needs to be commended for his screenplay. Though his work feels very improvisational, actors Falk and Rowlands both agree that Cassavetes was a writer first. He writes genuine scenes. He writes long scenes, and he lets them develop through natural dialogue and then refuses to let go once the ugliness begins. Most filmmakers would not show things so clearly because the effect it has on an audience isn’t pretty. This isn’t a fun movie to sit through. It was excruciating. But it’s also brilliant, and while I was severely depressed watching it, A Woman Under the Influence was simply too good to shut off. I remember four or five really long scenes, the dinner scene mentioned before, a spontaneous party Mabel throws her kids which is disastrous, a visit from Mabel’s doctor, Nick taking his children to the beach once their mom has been committed, and finally her return home, which is long and hopeless. An average film would have some kind of big statement. Either Mabel’s treatment would have cured her or she would take her own life. Sometimes life is most terrifying when things simply don’t change. People sometimes are beyond help, and a developed society cannot put an end to Mabel’s life. She has to live with it. These are my initial impressions after one viewing. 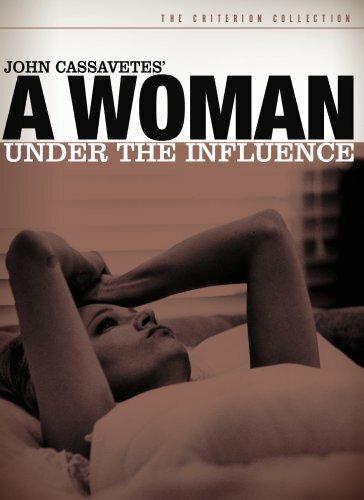 It is the first John Cassavetes film I’ve seen, and I’m eager to see more. I would also like to revisit my thoughts with greater distance. I feel I have not yet been lifted from the experience and my words are failing me. One thing I do know is that I don’t want to see this movie ever again. This is a knee-jerk reaction because as I write this I know this is a film I will study forever. But the experience is so overwhelming that I don’t think that anytime soon I could handle it again. It is a force. It’s not a motion picture. This is a living creature. It’s not bound by anything.